Telemedicine can be defined as the use of telecommunication and information technology to provide clinical health care services from a distance. Telemedicine helps in eliminating distance barriers between physician or healthcare service provider and patients and helps in improving access to medical services which would otherwise be difficult to make consistently available in distant rural communities. It is also used to save lives in critical care and emergency situations. Globally increasing internet penetration and usage technologies into healthcare practices is expected to drive the demand for the telemedicine technologies during the period of study. Geographically, North America dominates the telemedicine technologies market driven by best in class infrastructure, best in industry practices, higher technological usage by citizen & doctors and higher spending by the citizens towards healthcare expenditure. North America was followed by Europe and Asia-Pacific as second and third largest markets for the telemedicine technologies market. Asia Pacific is projected to have the fastest growth, owing to rapidly developing medical infrastructure, increasing medical tourism, increased spending, and increasing awareness amongst population in developing nations such as China and India in this region. This report identifies the telemedicine technologies market size in for the year 2014-2016, and forecast of the same for year 2021. 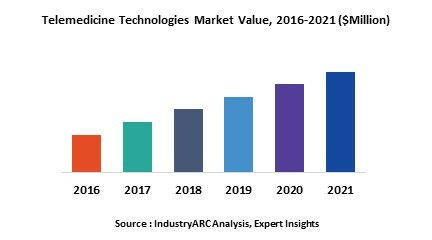 It also highlights the market drivers, restraints, growth indicators, challenges, and other key aspects with respect to global telemedicine technologies market. 11.1. Aerotel Medical Systems Ltd.
11.3. International Business Machines Corp.